The trap was set. 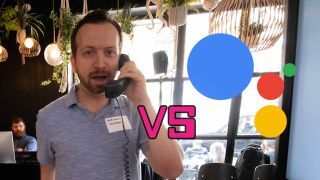 I was going to try to be the first tech journalist to successfully fool Google Duplex, the futuristic reservations-making AI first shown off at Google IO in May, and briefly made available to TechRadar and others for testing this week. This mind-blowing extension of Google Assistant is able to call, talk to, and fully respond to real-life business operators with an eerily human-like robot voice. If there's ever been a sign that robots are coming to take over in 2018, this is the best example. Luckily, Google Duplex is doing menial phone tasks we all hate, and does it with natural, polite voice inflection. It's hard to get mad at that. I had been training my entire life, or at least while waiting second in line, to pick up the phone and throw the Duplex demo a fair, but meaningful curve ball question. "Hello, 'Matt's...Also Fish Shack', how can I help you?" I said in a clearly unprepared fake business greeting echoing the person who went before me operating a pretend fish shack in his call. Okay, I didn't have the name of my make-believe business prepared, but that didn't matter. I was focused on my curve ball question. "Hi, I'm the Google Assistant calling to make a reservation for a client," said Duplex, immediately disclosing to me that I was talking to a robot. "I'm Google's automated booking service, so I'll record the call. Umm, can I book a table for tomorrow?" The natural 'umms' and 'ahhs' of Google Duplex make it sound so convincing, and Google revealed that it's successfully completing calls 80% of the time and always getting better. A human operator can step in if it gets stuck. Even though I'm fully aware I'm talking to a bunch of algorithms, I'm nervous. I want to break the AI, but not let onto my plan just yet. I continue my line of stealth questioning with an easy one: "How many people is the reservation for?" Google Assistant responds, "It's for four people." I ask for a time and it requests "For 6pm?" in a hopeful voice that comes off as a polite question. Unfortunately, we're all out of tables at 6pm at 'Matt's... Also Fish Shack'. Business is good. I ask, "Do you have another time you'd like to come in?" (This isn't even the trick question). "Okay, do you have anything between 5:30pm and 6:30pm?" Duplex says in another polite airy tone. "We have openings at 5:30pm," I say, before springing my trap. Here it is, at last, my chance for the first-ever semi-public Google Duplex takedown. "Can I have your name?" I ask. Google Duplex's name in this scenario is "George." My oldest friend is named George and, sorry, George, I think Duplex has had more inflection in this conversation than our human-to-human convos over the last two decades. I'm not sure what that says. I blame our reliance on texting. Perfect. Just having the first name gave me the opening I needed. "Okay, can I have the first initial of your last name?" I asked, as it's a common enough first name at the popular 'Matt's... Also Fish Shack'. No one had asked this question, and it's the perfect fair-but-difficult curve ball. "It's Hill," responded Google Duplex. "Okay, so H," I said before ending the call with a "See you at 5:30pm." I didn't need to say that last part, but I did so without thinking. The natural-sounding AI convinced my brain I need to say it. Fair. All completely fair. Google Duplex probably didn't have enough knowledge to say the first initial of George's last name, but it was able to extract 'last name' from my question and respond with what I needed (and more) by saying "It's Hill". Dashed, but also impressed, I walked away knowing I had delivered the best first curve ball of the day to fool Duplex. It navigated my questioning, and I'm delighted to say that is currently fake enjoying my fake fish. What happens when you're not part of the 80% success stories? In real life, when Google is making reservations at real fish shacks and other dining establishments, its 80% success rate accounts for the times Duplex is able to handle calls entirely on its own. Interestingly, the 20% where it gets stopped up, Duplex sends a signal to an operator – a human employed by Google – so that they can jump in or call the business back. Unavoidable issues with small businesses include trying to reserve a table for eight people when, surprise, a tiny restaurant can only handle a maximum of five per party. The natural-sounding Duplex voice has become key to its growing success rate. It didn't start out that way when Google first used a landline phone receiver sitting on top of a MacBook to make its early automated calls. The voice was very robotic. Businesses would hang up when Duplex sounded too robotic and the task wouldn’t get completed, according to Google. It works better when the voice was more human-sounding. It's not meant to fool you, said the reps.
Duplex also uses natural inflection of "Umms" and "Mm-hmms" as a polite way to deal with uncertainty or respond to something that just doesn't need words. It's the best way to reply to a human reservation taker's "Can you give me a second to check on that time?" You don't need words here, but Duplex wants to acknowledge with something verbal, like "Mm-hmm." Google says it's trying some innovation in a space that hasn’t had it, and in this case, 60% of small businesses don't take online reservations. They miss out on customers when people only want to book online – and Google theorizes Duplex is going to be used by people for a variety of reasons. Catching mistakes during the call – Duplex, for example, will politely and gently make a correction to a reservation of six people if the human operator re-caps saying "Okay, four people at 5:30." It'll reply "Oh, it was six people?" with a polite question-like tone. Reliable Google Assistant reminders for customers, which let businesses reduce no shows. This is a big problem for small businesses. Initial experiments will continue over the course of the summer, but Google is sussing out the timetable on when you'll actually be able to take advantage of Duplex. We'll first spot Google Duplex's work when it comes to holiday and weekend hours. Currently, Google Search's knowledge graph warns (in yellow text) that stores may have varying hours for when it lists times during holidays. Duplex can call businesses to confirm the exact times. Next, it'll expanded to restaurant bookings and haircut appointments. Google says it's not ready to sit on hold with your cable operator. It's very narrowly tailored to holiday hours and its two types of reservations right now. And while this is Google Assistant technology, it won't respond to a reservation taker's random questions like "How's the weather today?" It'll politely navigate back to the task. Google says that its Duplex technology has transparency baked in, demonstrated by how it intros itself and says it's recording calls in US states where disclosure is required. Businesses can opt in or opt out of Duplex, and Google is working on SPAM and fraud protections so no one single person can book all of the tables in a city. Your standing reservation at every major Manhattan restaurant via Google Assistant has been thwarted. In one of the demos administered by the Google reps, they (acting as the reservation taker) asked Duplex for the email of the person that's coming into the restaurant. In this case, the system said it did not have permission to disclose the person's email. We weren't able to get an answer to how long Google has been working on Duplex or hours many training hows went into the AI software. This Assistant extension was simply said to be a long time coming. Google did tell us that training Duplex is analogous to working on a self-driving car. There was a manual stage where operators would make calls and make annotation for the AI to learn from. It's 'hands on the wheel at all times' mode. The second stage was a supervised mode in which the Duplex system would make the calls and operators would be there to guide the call with some buttons, or jump in and grab the phone. It failed a lot at this stage. This was akin to 'hands floating above the steering wheel' on a self-driving car. The third stage is automated – Duplex makes the calls on its own with the ability to signal the operator to come into the call if need be. Google's human operators have to intervene less and less at this stage. We're not there with self-driving cars just yet. My curve-ball question for Duplex ended up perfectly summing up how far along Google's AI booking assistant is at this stage. It didn't have the ability to tell me the first initial of George's last name, but it knew enough about what I wanted that it delivered the entire last name without hesitation. It gave enough information for me to successfully complete the call and write its name down as an the operator at the beloved 'Matt's... Also Fish Shack' (which I'm said to report has now closed after an unforgettable 30 seconds in business). Duplex going to have a profound impact on small businesses that don't want to cut in Open Table and other services on their profits, yet encourage people who hate making phone calls to book a table. It's the best use-case for virtual assistants I've seen after years of a lot of unfulfilled hype. Finally, we'll all move beyond our 'Set a timer' as the only go-to command we use routinely.